We left off #26 with my Saturday visitors. Sunday morning the kids and I went to mass, but Agnes has her reservations and stayed abed, which turned out to be smart as the mass lasted for 2 hours! Catherine greeted us as we came out. Generally she attends the 2nd mass (in Swahili), which I enjoy through the window of my kitchen. However, her son Louis was a mass server, so she went to the early (English) mass. When I introduced Agnes’s children and said Agnes was visiting, she promised to come to see her. They had met in my house several years ago and have been cooperating and sharing ever since. 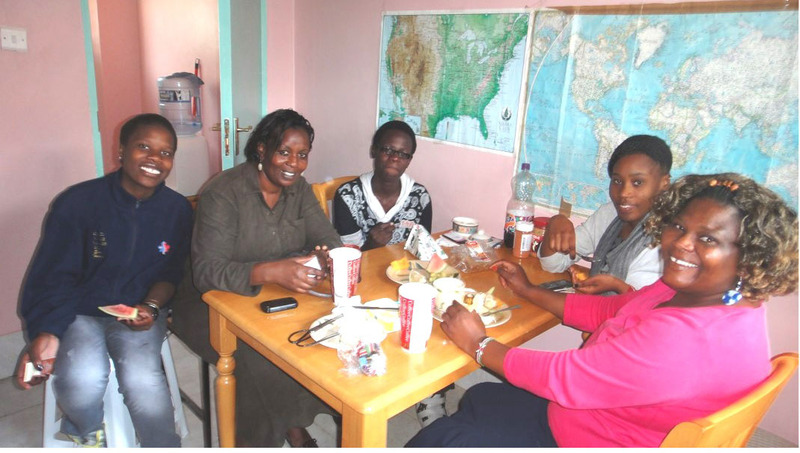 Wanjiru, Catherine’s cohort, especially works with Agnes. The air was alive with their energy and again, Agnes’s children saw that mom is really a VIP. We managed to make 6 eggs feed 6 people. We would have had toast, except that right as we were ready to toast, the power went off. It’s something that used to happen all the time, but this summer has been quite rare. We had bread, some with peanut butter and some had cereal. I think no one was left hungry. Agnes went off for a ½ hour meeting, which lasted for 3 hours (actually the other person was 1 hour late). The kids again cleaned up the kitchen and I relaxed briefly before Regina and her daughter, Jenny arrived. You may remember Regina, one of the first people I met here in 2005 when she was teaching math at Ndingi. Jenny loves PNB, so was happy with that. Regina was happy with the remains of my stew and we talked math teaching and other such compelling subjects. I had a short nap after she left until Agnes returned, after which I made grilled cheese sandwiches, another hit. I had just enough time to drive them to the matatu station before I had to meet Fr. Kiriti and Mary Fry for dinner. She stays at lovely hotels along the lake. If anyone wants to visit here, I assure you the hotels are really nice and the lake lovely, although mosquito repellent is needed in the evening. Most of the hotels had areas where hippos can be seen feeding in the evening, although we didn’t see any. We sat out under this lovely tree waiting for Mary and her party who had been meeting with colleagues on the other side of the lake and were delayed by traffic—yes even here! Dinner was really good, but brief, as it was after 8 pm and neither Fr. Kiriti nor I like to be out after dark. It has always been OK, and Sunday night is probably safer than others, but I did breathe a sigh of relief when I arrived here and again when I received a text that he, too, had arrived safely. But….my relief was short lived when I realized I didn’t have the key to my room, which is on the same ring as the key to my closet, both locked. ARGH!!! You can see in the picture the basket I used to carry things for Mary and for Fr. Kiriti. I had fished around in it several times. The keys must have fallen out then. RATS!! I knew Julia had a key to my room, but not to the closet. Fortunately I had been a bit of a slob and had not hung up a pair of jeans and a shirt, so I could dress in the morning, but eventually I would have to get into the closet. I called the hotel, describing our whereabouts and hoping my keys had been turned in. No such luck. First thing in the morning I searched the car to no avail. I did however, discover that the key to the closet in the other room also fits mine, so at least I could access my clothes. I asked the rectory cook if anyone had turned in keys. No, pole sana. Walking back into the Mji Wa Neema compound I saw several folks chatting and described my keys. Paul, a catechist, said he’d found some keys down by the church and had hung them on the notice board. He ran off to fetch them and sure enough, they were mine! Such a relief. My “tuitioning” class continues to grow. Seventeen came on Monday and today (Tuesday) there were 20. As delighted as I am so see new faces, it means re-teaching at least some of the material especially since most of the newcomers are form 1’s who had never seen what we had been talking about. 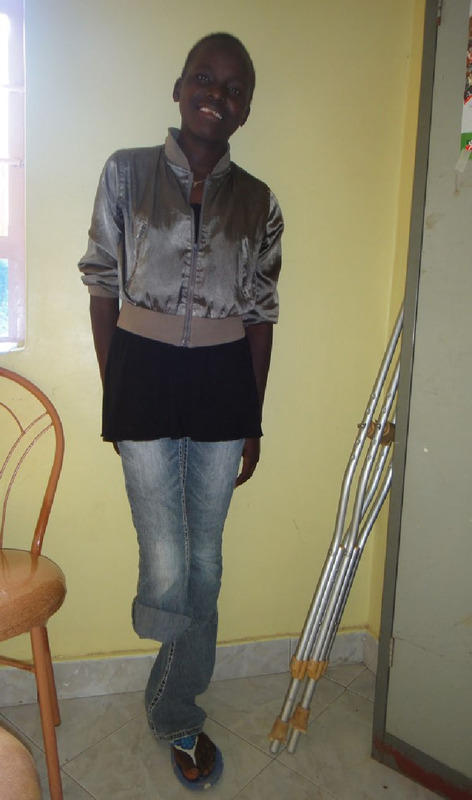 Last week, Maureen, an SFG form 1 brought her sister, who arrived on crutches, her right leg having been amputated about at the knee. I later learned she had been in an accident in which the father had been killed, leaving an unemployed wife and 6 children. Maureen had been in Longenot elementary school and is sponsored by Mary Fry, but her sister, a form 2 at Naivasha Day high school had not been at another school so Mary didn’t know about her. I quickly saw that the sister, Jacqueline, was bright and an eager learner. After class I spoke to her about possibly attending SFG where she wouldn’t need to walk so much. She indicated she would like that very much, but her mom couldn’t pay school fees for a private school. She had missed so much school this year she thought she would need to repeat form 2. I explained about possibly being sponsored through Kenya Help, which perked her right up, and told her about seeing Jecinta. So, when she didn’t show up the next 2 days I was disappointed. 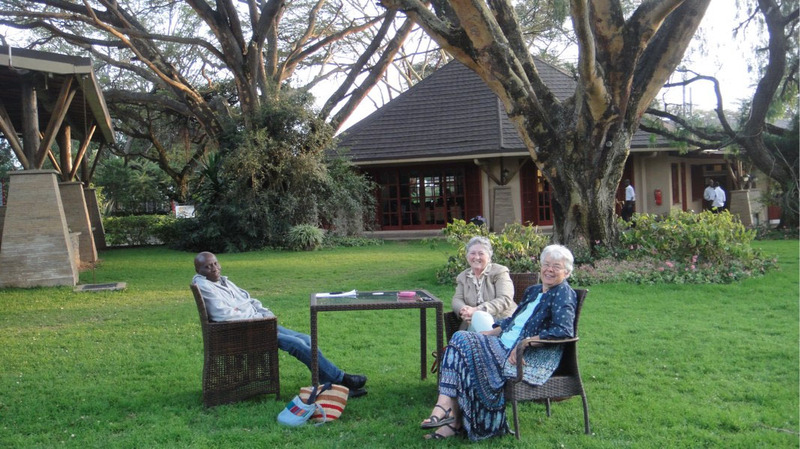 Later I learned the mother didn’t have the 30 bob each way for a piki piki to bring her – too far for crutches. That’s about $.70 round trip. Yesterday I talked to Maureen, who explained why Jacqueline had not come. I gave her the 60 bob and urged her to bring her mom and all of Jacqueline’s information, including her certificate for KCPE, on which she had earned 316, a very respectable grade. Shortly they arrived and I took them to Jeicnta’s office. Just after that, Mary Fry arrived to give me her last-minute gifts that she had not had time to distribute, including boxes of books, soccer balls, art pens and a big bag of darling rag dolls, made by her colleague, Nora. When I told her Maureen’s mother and sister were with Jecinta and a bit about their story she wanted to go see them. I left them to chat but soon after Mary left, it occurred to me that Maureen and Jacqueline have 3 small sisters, who, I was sure would love a dolly. When I took them to Jecinta’s office and gave them to the mom, I don’t know whether she was more pleased with the dolls or with the prospect of sending Jacqueline to SFG. I asked Jacqueline whether I could take a full photo of her, to which she agreed. I am full of admiration for this spunky girl who lost her father and her leg just this last February. She seems remarkably well adjusted and ready to face life on whatever terms are presented. It was so good to connect this family with Jecinta, who not only is the person accepting applications for scholarship, and social worker as well, but also supervises the cases of children with disabilities in this area. She is the one who would know whether services are available for prosthesis. I felt the mother’s profound relief and gratitude that somehow she would be getting some help. This is the area where Jecinta shines! Jacqueline was back in class today, bright and eager to learn. She’s a great kid. As happens so often in the mysteries of the universe, last night a friend emailed me saying, “please keep your eye out for a girl (esp. one at Mji Wa Neema) for me to sponsor with a group of women friends.” Does that make you teary? I wrote back, telling about Jacqueline. We’ll see what happens, but I felt, as I so often do that “Somebody is pulling the strings and it certainly is not me!” Wonderful things “just happen”.